What's On That Meat Label? As a pig farmer, I am always concerned about consumers having the correct information when they are buying pork. And sometimes, the meat label is a little confusing. A couple of years ago I attended an ag conference and was listening to a panel of women; a foodie blogger, a mommy blogger and an extension educator. They were discussing their personal experiences at their local meat counter. One statement they all agreed on were labels at the meat counter were confusing. At times, they chose not to buy meat because they simply didn’t know what the labels meant or what they were buying. As a pig farmer, I felt like someone punched me in the stomach. 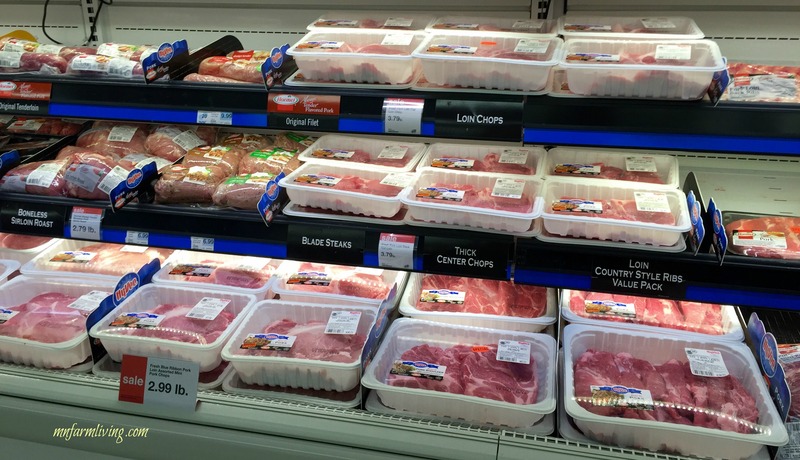 As a pig farmer, the last thing I want is for people to walk away from the meat counter because of label confusion. Here is a list of meat package labels along with their meanings. First and foremost, all pork is safe to eat. No matter what the label states. The terms “no antibiotics added” may be used on labels for meat products if documentation is provided by the producer to the Agency demonstrating that the animals were raised without antibiotics. It’s important to remember that all meat is antibiotic free. It is illegal for farmers to sell meat animals with antibiotic residue. When an animal is sick, antibiotics are prescribed by a veterinarian. As a farmer, we take administering antibiotics seriously. We are required to follow FDA mandates and follow drug withdrawals (withdrawal is the time between the last time an antibiotic is administered and the time an animal is sent to market). Organic is a labeling term that indicates that the food is grown through approved methods. The organic standards describe the specific requirements that must be verified by a USDA-accredited certifying agent before products can be labeled USDA organic. Must be fed certified organic feed. The feed cannot contain animal by-products, antibiotics or genetically engineered grains and cannot be grown using synthetic pesticides or chemical fertilizers. A product containing no artificial ingredient or added color and is only minimally processed. Minimal processing means that the product was processed in a manner that does not fundamentally change the product. Since this is all true of all fresh meat, this label is meaningless. This term has no USDA guidelines. What defines “local” may vary from one person to another. For some it may represent a drive to a farmer’s market, for others it may be a broader geographic region. Again, the most important thing to remember is all pork is safe to eat, no matter what the meat label says.